Wooden Inlay Yellow Gold Wedding Ring : LOVE2HAVE in the UK! Our silver wedding rings with wooden inlays are very popular but how about considering a gold version with a wooden inlay as an alternative? We think gold (especially 9ct yellow for this ring) contrasts wonderfully with the natural colour of wood giving this ring a particularly pleasing look. While gold is far more expensive than silver, it makes a more suitable option for a wedding ring and when combined with wood makes a fantastic alternative rustic or even spiritual choice. The ring comes finished with the highest craftsmanship, and we fully guarantee the quality. As far as specification the wood featured is Cocobolo wood, which has the tiger-like stripes of dark reds and browns. 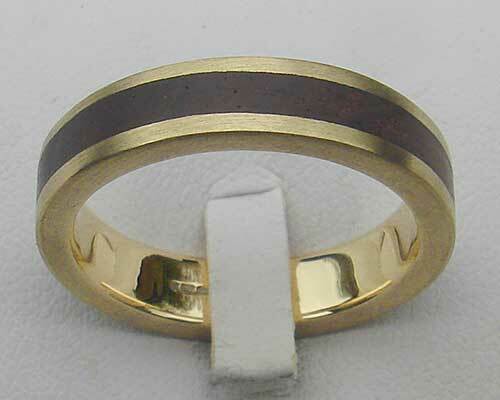 The ring's width is 5mm, the wood inlay is 2.5mm, and it comes with a flat profile finished to a comfortable fit.